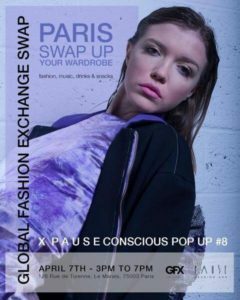 Paris: PAUSE Conscious The Sustainable Fashion Pop Up that you cannot miss! Pause Fashion Hub was conceptualized in 2013 by co-founders Romi and Leticia when they discovered they shared the same passion and values for long lasting fashion that show personality. With PAUSE, the founders aim to spread the message of importance of consciousness through art, sustainable consumption and living and creative collaborations. PAUSE has already held several successful editions of their conscious pop ups in New York and Amsterdam with an upcoming one in London in July. 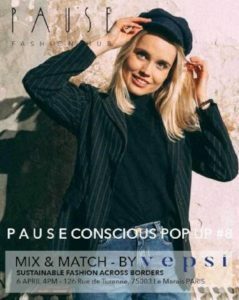 The PAUSE Conscious Pop Up #8 PARIS is an initiative by Pause Fashion Hub, bringing customers a pop-up store experience focusing on sustainable fashion. The seven-day dynamic pop up store will bring together a curated experience for all those interested in sustainable fashion, art, live performances and music. The online SWAP shop powered by Lablaco – a global platform committed to making fashion circular and raise awareness on fashion waste. Mix and Match by VEPSI – which will promote an interactive exchange between designers and the audience. The event will also enable influencers and the audience alike to interact with the designers and create looks with different pieces from their collections. AFRICA Fashion Talk – Ramata Diallo – founder of Fashion Consulting Paris, will share with the audience her experiences with the local fashion scene of West Africa. If you are interested in scouting the local fashion scene in Paris or looking to interact with a gamut of international brands working towards sustainable fashion, we highly recommend you to head over to the PAUSE FASHION HUB website for more details on the event. Follow our Instagram for more such unique finds from all over Europe.